What is the TukTuk Tournament? The aim of the Tuktuk Tournament is for YOU and your companions to fully integrate into the culture of Sri Lanka, to make you explore the heart and soul of the island through the eyes of locals while keeping the concept of “sustainable tourism” at heart. You will be completely immersed into Sri Lankan life through its food, art, sports, fashion and people. In the tournament you are immersed into a magical story as you journey across the scared island of Ceylon completing quests, challenges, and collecting treasure. You will immerse yourself into the lives of locals, hunt and gather delicious food, uncover breathtaking mountains, discover unknown roads, pray at unreachable temples, swim in divine waterfalls, explore ancient ruins, harvest tea and coffee with locals, and maybe even get chased by stray elephants! You will be given quests and challenges that will spread you and your team of comrades all over the island to get you off-the-beaten track and give you experiences that go far beyond mainstream tourism. You will interact and integrate with the local Sri Lankan culture and people in true and meaningful ways. This all while pioneering the island in your self-driven tuktuk by “choosing your own adventure” to uncover it’s magic, the people and the true heart and soul of Ceylon. The 13th of December 2017 marked the closing of the first ever Tuktuk Tournament. With over 45 participants and 18 Tuktuks competing in an epic bounty hunt exploring the true, raw, and beautiful island of Sri Lanka, it was an experience not to be missed. Teams from all over the globe were represented in an action packed 10 days of pioneering Sri Lanka under the sponsorship of Red Bull. We had teams from around the globe representing; Belgium, Italy, South Africa, United States, Norway, UAE, Switzerland, Australia, Austria, The Netherlands, Colombia, United Kingdom, Canada and Germany. Freaky White Rabbits (Ellen and Marco, The Netherlands) – 724 Gems Collected & claiming the Tri-Wheel Trophy! 1000KM LIMIT. This means that teams need to play hard and smart in order to collect the most bounty in the 10 day period. It also means you aren’t driving all night and day and that you have time to stop and enjoy the scenery or a cup of tea. You can drive more than 1000km, your magical chariot (tuktuk) won’t actually explode, but you will start to be penalised a percentage of your points the further you go over this limit. Each team on the Tournament has their own totem. The totem is the living and breathing incarnate of that team. It is the spiritual essence of the team and carries all of their yin and yang energy. It is a precious treasure that must be protected. For the 2017 Tournament, stealing the “totem” would result in a 3 point penalty for the affected team, but, after 5 days on the road we changed this and converted stealing into a “team building” exercise. Though team building, heroes could gain points by joining together and completing challenges together. This lead to much more positive interactions. 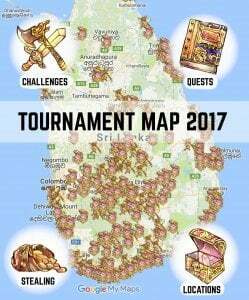 Along with your quest book, a very important aspect of your journey is the Tournament map. This is a digital map made on google maps with the GPS coordinates of all of the CHALLENGES and LOCATIONS that are present throughout the Tournament. You will be reading and studying this map to figure out how to collect the most treasure in the least amount of kilometers as you traverse the island. To help aid in taking people on a journey, on an integrated experience through Sri Lanka, the Tournament team also makes video diaries throughout the Tournament to look into very important matters! Keeping people updated about all aspects of the tournament. Please see some examples below. I will never forget the moment when the Guardians of the Nebulosa walked into my life. I’m leisurely sitting at the table eating my dinner at the guesthouse when I look up to see the new guests arrive. My first though, “What the hell is this?” A religious group? No, I’ve been on this island long enough to know they didn’t belong to any religious group. Besides, the fruit on their shirts and little red hats gave them more of a carny feel. Like they were part of a travelling circus. But most of all, they looked as if they had their asses handed to them. I was instantly absorbed into their adventure and wanted to help them in any way that I could. Water, food, where to find gems and most importantly, helping them celebrate their first night on the island. Edgar pulled out a leather pouch that concealed a bottle of rum that made the voyage with him. At the end of the evening the bottle held only enough rum to be left behind for me to savour. The next few days we would look for #guardiansofthenebulosa, #tuktuktournament, #tuktukrental on our feed to see what “the boys” had been up to. We loved following them around the island and comparing their efforts to other teams. I almost pulled the trigger twice to sign up for next year. Soon the tournament ended and to our shock the Guardians of the Nebulosa didn’t win. However, I still had the bottle of rum to enjoy. The leather pouch replaced a worn out bag and travels around the world with us. I felt that the bottle journeyed so far to the island and it’s story shouldn’t end. A note was rolled and tucked into it and left on the beach for someone to find. The note? A love story of course. 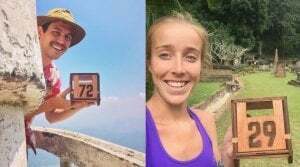 “This has changed the way that I travel forever” said Marco and Ellen, the winners of the tournament. This wasn’t because they were driving a tuktuk, it’s actually in reference to the unbelievable amount of true and genuine interactions they had with locals. The 2018 tournament will take place from the 20th of October till the 3rd of November. More information can be found on www.tuktuktournament.com. To keep receiving updates, please put yourself on ‘attending’ in the Facebook Event, here.